Ship is still being tested and all vital statistics are subject to change. 305 mm/52 Model 19075 х 2 pcs. 180 Degree Turn Time56.25 sec. Initial HE Shell Velocity762 m./s. Initial AP Shell Velocity762 m./s. 120 mm/50 Model 190514 х 1 pcs. Initial HE Shell Velocity823 m./s. 130 mm/55 Model 191314 х 1 pcs. 75 mm Canet naval gun8 х 1 pcs. Knyaz Suvorov — Soviet Tier III battleship. 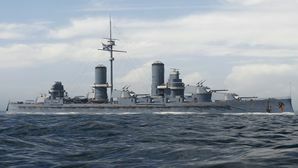 Originating from a project to design a "large high-speed battleship with modern artillery", created on the basis of the experience of the Russo-Japanese War (the New Shipbuilding project). The battleship's armament was represented by 305 mm guns with outstanding ballistic qualities for their time. Knyaz Suvorov (Russian: Князь Суворов) was a Borodino-class pre-dreadnought battleship built for the Imperial Russian Navy in the first decade of the 20th century. Named after the 18th-century Russian general Prince (Knyaz) Alexander Suvorov, the ship was completed after the beginning of the Russo-Japanese War in 1904. She became the flagship of Vice Admiral Zinovy Rozhestvensky, commander of the Second Pacific Squadron that was sent to the Far East a few months after her completion to break the Japanese blockade of Port Arthur. The Japanese captured the port while the squadron was in transit and their destination was changed to Vladivostok. Knyaz Suvorov was sunk during the Battle of Tsushima on 27 May 1905. During the battle, the ship fell out of the main battle line after a shell hit her bridge, killing her helmsman and wounding her captain and Rozhestvensky. She was eventually torpedoed and sunk by Japanese torpedo boats; other than the 20 wounded officers evacuated by a destroyer there were no survivors. This page was last modified on 21 March 2019, at 08:16.